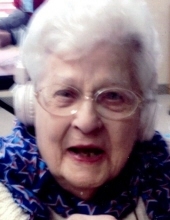 Rachel E. Rocholl, age 100, of Aurora, IL, passed away peacefully on Wednesday, January 30, 2019 at Alden of Waterford in Aurora, IL. She was born September 8, 1918 in Lawrence, Kansas, daughter to the late Lawrence and Becky (Lowery) Smith. Rachel was a member of the Westminster Presbyterian Church in Aurora, where she was a librarian and a member of the PEO. She was employed as a secretary at Caterpillar until her retirement in 1959. She is survived by her son, Bill (Amy) Rocholl, Jr.; her stepchildren, Vicki (Ken) Shaw, Nancy (Dan) Lirot and Cheryl (Nate) Mulvihill; her grandchildren: Robert, Annette, Susan, Scott, Michelle, Debbie, Chris, Betsy, Jennifer, Stasi, Mindy, John, Dana, Adam and Allison; thirty great grandchildren; numerous great great grandchildren; and her nephew, Chip Dempsey. She was preceded in death by her parents; her husband, William Rocholl Sr.; her stepdaughter, Sally Milfelt; sister, Phyllis Dempsey. Visitation will be held on Wednesday, February 6, 2019, from 10:00 AM until the Memorial Service at 12:00 PM at DUNN FAMILY FUNERAL HOME with CREMATORY 1801 S. Douglas, Oswego, IL 60543. Inurnment will follow at Pearce Cemetery. To send flowers or a remembrance gift to the family of Rachel E. Rocholl, please visit our Tribute Store. "Email Address" would like to share the life celebration of Rachel E. Rocholl. Click on the "link" to go to share a favorite memory or leave a condolence message for the family.